The PEL has a key role in the Dragonfly mission to Titan, recently downselected for further study for potential launch under NASA's New Frontiers Program. Dragonfly is a drone-like rotorcraft that would explore the prebiotic chemistry and habitability of dozens of sites on Saturn’s moon Titan, an ocean world in our solar system. If selected, the PEL will provide the mass spectrometer to examine surface composition. Dr. Melissa Trainer is one of two Deputy PIs for the mission as well as the lead of the mass spectrometer. Dr. William Brinckerhoff is also on the mass spectrometer and science teams. 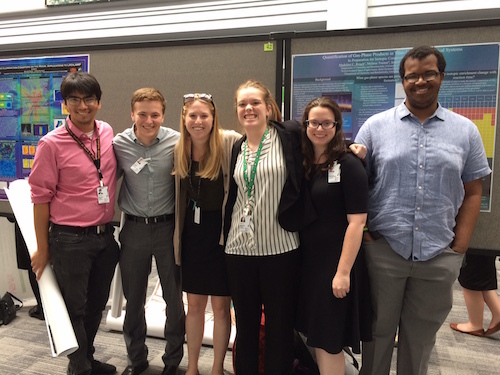 The Planetary Environments Laboratory interns for Summer 2017 successfully completed their projects including presentations at the annual Intern Poster Session. Shown from left to right are: Greg Wong (PSU), Jeff Davis (UMCP), Allison Fox (PSU), Maddie Roach (UNI), Rebecca Funderburg (TCU), and Trey Jean-Baptiste (Howard). Domagal-Goldman, Holmes, Kopparapu, Melak and Ramu win 690 Peer Awards! Shawn Domagal-Goldman, Vincent Holmes, Ravi Kopparapu, Tony Melak, and Guru Ramu were honored by their Solar System Exploration Division peers on August 9th! The Planetary Environments Lab is proud and appreciative of our scientists and engineers who are very deserving of their accolades. Dr. Amy McAdam and Christine Knudson participated in the 2017 Solar System Exploration Research Virtual Institute (SSERVI) Remote, In Situ, and Synchrotron Studies for Science and Exploration (RIS4E) expedition to the Portillo Volcanic Field in New Mexico June 4-10, 2017. 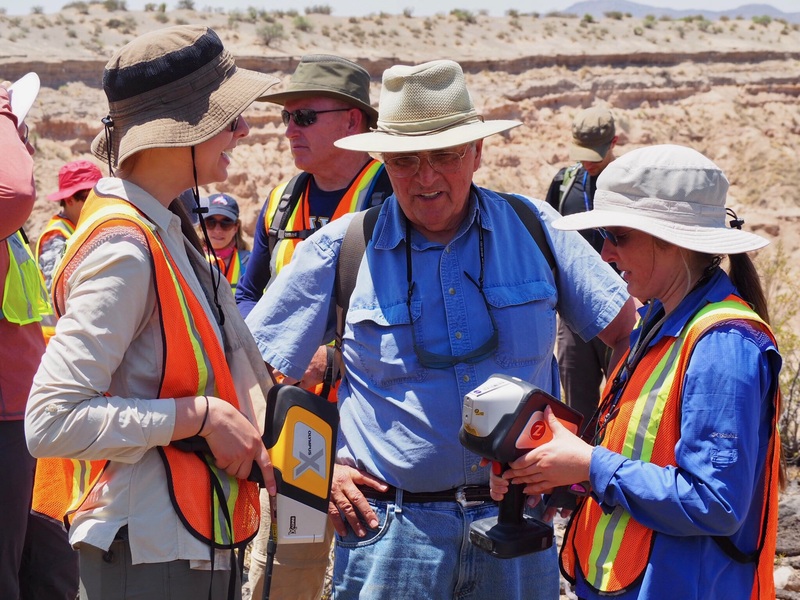 They brought a handheld Laser Induced Breakdown Spectroscopy (LIBS) instrument with them, which allowed them to get elemental information about the volcanic rocks and ash they were looking at while in the field. These analyses were complementary to elemental data collected with a handheld x-ray fluorescence (XRF) instrument by Kelsey Young. The two were there to assist the simulated Extravehicular Activities (EVAs) planned by Kelsey Young and Jake Bleacher. These EVAs were led by a geologist and an astronaut. For this field expedition, the geologist was Liz Rampe from Johnson Space Center (JSC) and the astronaut role was filled by Butch Wilmore, an astronaut who spent over 150 days on the International Space Station (ISS). Domagal-Goldman describes the "Search for a second habitable Earth"
Shawn Domagal-Goldman did an interview for a piece on Engadget on “The search for a second habitable Earth.” In the article, Domagal-Goldman discusses the hopes and challenges for discovering habitable (and inhabited) planets such as those in the Trappist-1 seven-planet system discovered in February. The Trappist-1 exoplanets will be one of the first targets of the $8.7 billion James Webb space telescope (JWST), set to launch in 2018. "Whether or not I'm optimistic that any life is out there, I am very optimistic that we're going to find out [either way]. And I don't think we've ever had a moment like this in the history of our species." Charles Malespin is a recipient of the 2017 NASA Agency Honor Award for "Exemplary performance in the development of groundbreaking experiments which enhanced science return from the Mars Science Laboratory mission." The Early Career Public Achievement Medal is a prestigious medal which is awarded for unusual and significant performance during the first 10 years of an individual's career in support of the NASA mission. Shawn Domagal-Goldman’s TEDx MidAtlantic talk is now available for viewing on YouTube. In this presentation, Shawn went over how the last 20 years of exoplanet discovery has confirmed that other potentially habitable worlds exist, and the challenges we’ll need to overcome in order to find out if any exoplanets have signs of life. The talk is available at: https://www.youtube.com/watch?v=Lp7BL-UI0Rw. Scientist Pamela Conrad helps give NASA’s Curiosity rover a daily to-do list to look for life’s building blocks on Mars. Do dead planets sometimes appear alive and vice versa? Goddard researcher Shawn Domagal-Goldman uses computer modeling to imagine all kinds of planets and predict how our instruments might see them. Jim Garvin, Pam Conrad and Michelle Thaller were featured on dozens of television stations during a Liveshot campaign for the MAVEN launch. The viewership of the stations included several million people. For applications from analyzing the chirality of amino acids on icy moons to measuring carbon-cycle gases on the run, researchers in the Solar System Exploration Division are developing advanced technologies to get the job done. New SAM Website is Launched! The new SAM (Sample Analysis at Mars) website has been launched. Visit the page to learn more about the SAM experiment on the Mars Science Laboratory Mission, currently on its way to Mars. Congratulations to the OSIRIS-REx Team! Today we heard that the Origins, Spectral Interpretation, Resource Identification, Security - Regolith Explorer (OSIRIS-REx) mission was selected as the next New Frontiers class mission. OSIRIS-Rex is a sample return mission to an asteroid that will launch in 2016, and spend over a year exploring 1999 RQ36, acquire samples while providing geologic context, and return to Earth in 2023. GSFC will manage the mission and provide the OSIRIS-REx Visible and Infrared Spectrometer (OVIRS) instrument. Paul Mahaffy will be presenting a seminar at Howard University's Department of Physics and Astronomy on March 30, 2011 at 3:30 p.m. The subject for the seminar is "A New Generation of Science on the Surface of Mars with the Curiosity Rover." In this MSNBC article, Jen Eigenbrode discusses the "molecular fossils" that microorganisms can leave behind. Did meteorites preordain left-loving life? Nature News interviewed Danny Glavin (699) on his research that some carbon rich meteorites are high in left-handed amino acids, while others contain an equal balance between these and their mirror-image counterparts. Three members of the Planetary Environments Laboratory are in the arctic participating in the AMASE field campaign. Amy McAdam, Inge ten Kate, and Jennifer Stern are in this unique analog site testing instruments site that either have similar capabilities to SAM, or are under development for future "Search for Life" missions to Mars. Svalbards unique carbonate deposits which formed when a volcano erupted under glacial ice are strikingly similar to those found in the Martian meteorite ALH84001. Follow along on Inge's blog to see what the crew is up to! Drs. 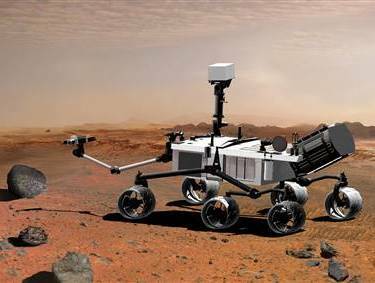 Jennifer Eigenbrode and Paul Mahaffy are quoted commenting on the new Mars probe tool and the current SAM instrument to Discovery News. NASA selected three proposals as candidates under the New Frontiers program, and Goddard has a role in two of them. One of the proposals selected for study was the Origins Spectral Interpretation Resource Identification Security Regolith Explorer mission (OSIRIS-REx). The OSIRIS-REx spacecraft would rendezvous and orbit a primitive asteroid. After extensive measurements, instruments would collect a pristine sample from the asteroid's surface for return to Earth. The other proposal selected with a Goddard component was the Surface and Atmosphere Geochemical Explorer, or SAGE, mission to Venus. SAGE would release a probe to descend through the planet's atmosphere and obtain meteorological data. The probe then would land on the surface of Venus to measure its composition and mineralogy. Goddard's Dr. Paul Mahaffy and Dr. William Brinckerhoff (Code 699) are co-investigators for a Goddard-led instrument on this mission.